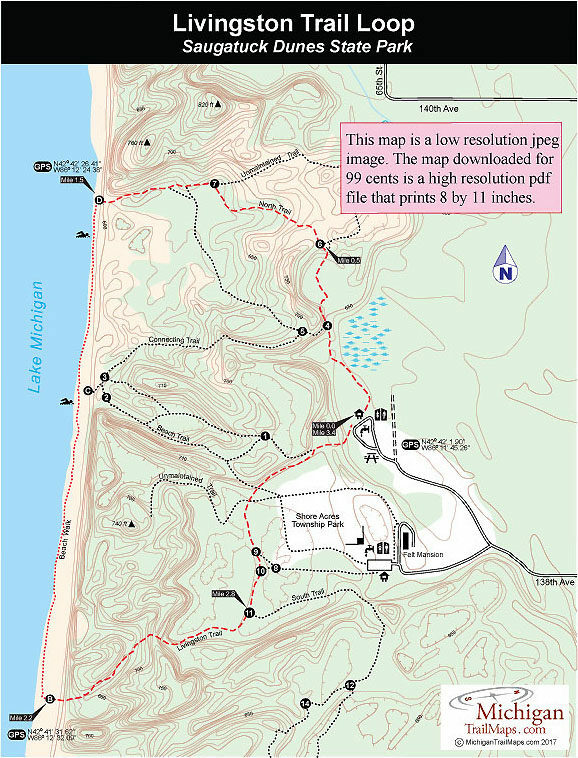 Saugatuck Dunes State Park’s 14-mile network of footpaths is divided into three basic loops referred to on park maps as North Trail, Beach Trail, and South Trail. All are wide paths and well marked with location maps at almost every junction. The loop described here is a combination of the North Trail, a beach walk and a return via Livingston Trail. 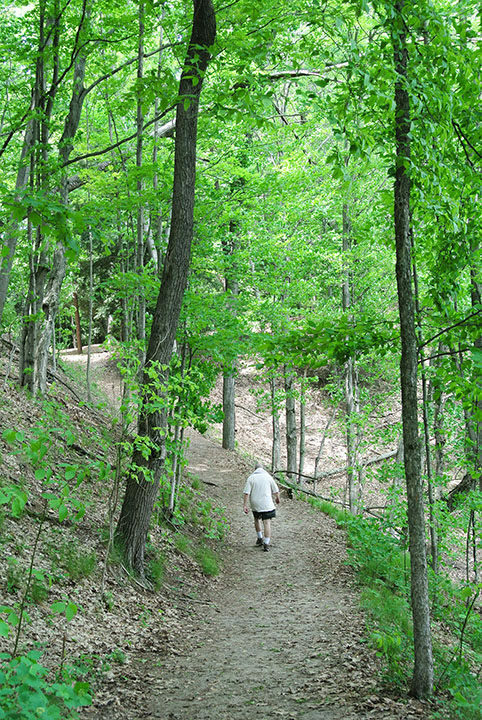 The 3.4-mile outing offers hikers a pleasant mix of open dunes, stands of pine and hardwoods, impressive overviews of Lake Michigan from high, sandy bluffs and a stroll down an uncluttered beach for more than a mile. A midday hike on a summer weekend results in encounters only with the kind of wildlife that wears bathing suits and carries in beach towels and suntan lotion. If you take to the paths early in the morning or during the early evening though, it’s possible to spot a variety of woodland animals including whitetail deer, woodchuck, chipmunk, rabbit, and raccoon. Experienced birders find the park rich in species, including the common tern (which is not such a common sight in Michigan anymore). You’re more likely to spot brown thrashers, grosbeaks, pileated woodpeckers, tufted titmouses, and even great horned owls and turkey vultures. The trailhead for the Center and South Trails is easy to spot from the south end of the parking area. The trailhead for the North Trails is a little more obscured and begins at the north end of the parking lot. The trail quickly enters the woods and appears as the typical wide path built to accommodate skiers in the winter. At the beginning you trek beside a wooded dune ridge to the west and a marsh on the right. The birds should be plentiful around the marsh, as will be wildflowers in spring and early summer when at times it’s even possible to spot pink ladyslipper orchids. Within a quarter mile the trail climbs away from the marsh and arrives at post No. 4. Head north (right) at the junction and the wide trail will continue to skirt the base of the wooded dune and then pass a Not A Marked Trail! sign just before arriving at post No. 6 at Mile 0.5. Both junctions to the right lead to what is occasionally referred to as the Outer Loop of the North Trail, a hard-to-follow segment in open sand. Stay left and soon you’ll be in the rolling topography normally associated with dune country and within 0.3 mile arrive at post No. 7, marking the west end of the Outer Loop. The main trail continues west (left) passing two unmarked trails to the south that complete the North Trail loop and then climbs a forested dune, topping off to a scenic view of Lake Michigan. You descend along a sandy path and at Mile 1.1 arrive at post D, half buried in sand and often easily missed. Head south along the beach. At Mile 1.5 you pass post C, marking the access to Beach Trail. This one is easy to spot as there are three benches on the bluff above it. 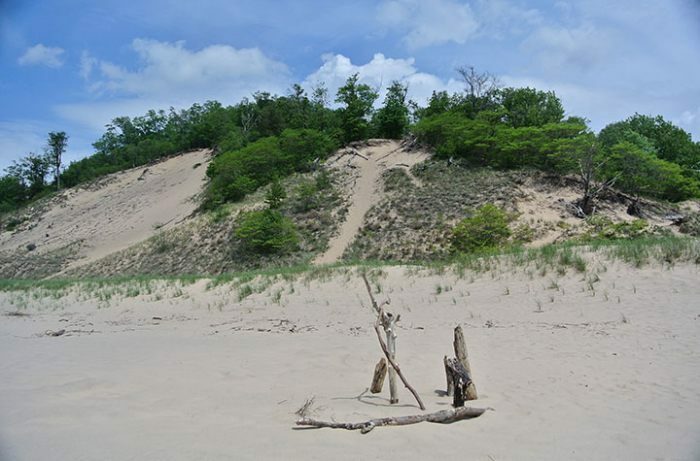 Continuing south, you come to the west end of Livingston Trail at Mile 2.2 which is marked with a signpost on the edge of the forest where the trail leaves the open dunes to disappear into the trees. From the beach you climb the shoreline dune and then descend along a ravine between two forested dunes where the scenery changes dramatically. In almost no time at all you have moved from the endless views of Lake Michigan to a tight cut in a thick forest. Livingston Trail descends off this dune and bottoms out in a stand of impressive beech and maple that are stunning in the fall. At Mile 2.8 you arrive at post No. 9, marking the junction between the Livingston Trail and South Trail. Head north (left). The final leg is the return to the trailhead and can be a bit confusing due to all the trails that are passed. Within a few hundred yards you pass post No. 10 and post No. 9 marking trails heading east to Shore Acres Township Park and then parallel segments of the township park’s mountain bike single track. If that wasn’t enough, you then pass the junctions with a pair of old two-tracks, the first posted with a Not A Marked Trail! sign. The main trail, however, is the widest and most easily distinguished and at Mile 3.2 arrives at the junction with the Beach Trail, which is clearly posted. Head east (right) and it’s less than a quarter mile back to the trailhead parking lot. At the park's trailhead are tables, grills, vault toilets, a shelter, drinking water, a display board and parking. 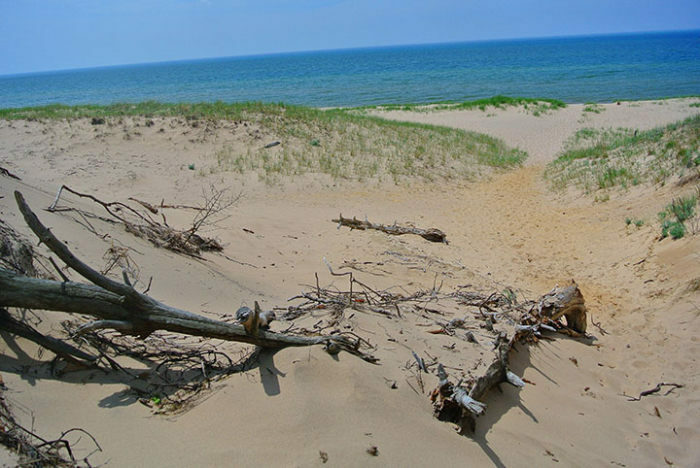 Saugatuck Dunes State Park is open year round and is popular with Nordic skiers and snowshoers in the winter. 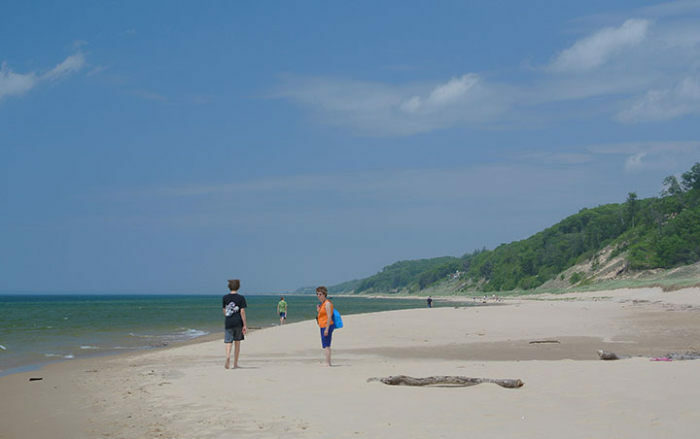 A daily vehicle entry permit or an annual state park pass is required to visit Saugatuck Dunes. The park is reached from I-196, just north of the town of Saugatuck. Depart at exit 41 and go west on Blue Star Memorial Highway. You immediately turn right onto 64th Street, just west of the overpass. Head north for 1 mile and turn west (left) onto 138th Avenue, where a sign points the way to the state park. Follow 138th Avenue to the park entrance. For more information on this unit, contact Van Buren State Park (269-637-2788).